Radon is a radioactive gas and it is dangerous because we can't see, smell or taste it: you need special equipment to detect it. It emanates from the rocks and soil found almost everywhere in the world. 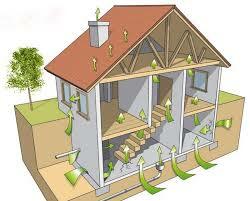 The radon level in the air we breathe outside is very low but can be higher inside buildings. The EU forces the Spanish Government to eliminate radon in homes and workplaces after 30 years of ignored scientific warnings. Examining both the UK and the Spanish radon maps, we find that both maps show a highly percentage of this gas on the North-East side of both countries. Here in Spain the women of the province of Ourense in Galicia lead a sad and mysterious statistic: they are the Spanish women most affected by lung cancer. And it is not due to the perverse effect of tobacco, statistically, they smoke the same as lady from Alicante, the fault is the radon gas. This imperceptible gas, that emanates from the subsoil of a good part of the Peninsula concentrates in homes and places of work, especially in basements and ground floors. The European Union recognizes that this constant exposure to radon poses a significant risk to health and, after 30 years of scientific warnings, will force the Spanish government, long las,t to take action next year. It is in the granite subsoils where more radon is generated because its rocks are rich in uranium, the source element of this gas. The areas of greatest risk in Spain are Galicia, with the provinces of Ourense and Pontevedra at the head, an important area of Castile and León, Extremadura, the Community of Madrid and certain areas of Castile La Mancha, according to the Nuclear Safety Council. What this element does is to emit very energetic alpha particles, that continuously impact against the pulmonary epithelium and multiply the risk of suffering cancer, even to a greater extent than the environmental tobacco smoke. It just has been published the most accurate map of the critical points of Galician territory, based on 3,000 measurements. Practically all of Galicia is a risk zone and there are areas where almost all workplaces have this consideration. Here on Coast we are in one of the safest parts of Spain as there are little granite rock formation. 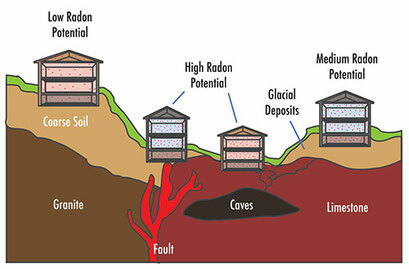 The European Union approved in 2013 a directive (2013/59 / Euratom) that will come into force next year and that for the first time obliges governments to take measurements in workplaces located in risk areas and mitigate the concentration of radon in which a minimum of 300 Becquerels per cubic meter is recorded, the unit of measurement used with this gas is equivalent to the atomic disintegration that occurs in a second. The member countries must also introduce specific requirements in the building codes that prevent the entry of this gas into new buildings and "encourage" their reduction in existing houses. The experts of the Radon Laboratory of Galicia congratulate themselves that finally the Administration is required to protect the citizens of this carcinogen but consider "insufficient" the "action level" marked by the EU (300 Becquerels querels per cubic meter) taking into account that in the United States it is 148 Becquerels and that the World Health Organization sets the danger border at 100. In this university research centre they recall measurements in Galician homes in which up to 3,000 and 4,000 Becquerels were detected. The Ministry of Health has created a working group to draft a state action plan against radon "in homes, public buildings and workplaces." The Ministry of Public Works processed a decree during 2017 to introduce in the Technical Building Code "regulatory requirements related to protection against radon gas in residential buildings". The changes, according to official sources of this department, will include requirements for the works to be carried out on buildings built where the reference level that the Spanish Government determines is exceeded, which may not be greater than the 300 Becquerels set by the European directive. This new regulation against radon, a forgotten" pollutant, will help significantly improve the air quality of closed spaces without being traumatic, because the construction sector is well prepared. Radon is unknown even to doctors in Spain. And the Spanish authorities have so far looked the other way. The dangerousness of this invisible aggressor was discovered in 1985, when Stanley Watras, an employee of a nuclear plant in Pennsylvania, set off the alarms of the complex with an unusual radiation in the body that he had not acquired in his workplace but in his home. In the USA, measures were taken against radon only three years after that incident and in the United Kingdom the levels of this gas influence even the price of a house. The model to follow, indicate the experts, is Ireland, where between 2000 and 2005 were made tens of thousands of measurements to know in detail their incidence throughout the country. Three Irish businessmen were sentenced in 2010 to prison terms, they point out from the Radon Laboratory in Galicia, for not controlling radon in their work centres. Is it better to buy second hand or build your own home?